The Archaeological Conservancy is excited to announce the launch of our crowdfunding campaign for POINT-6 (Protect Our Irreplaceable National Treasures) on Monday April 23rd. This is an emergency acquisition project is intended to purchase and preserve significant sites in danger of destruction. 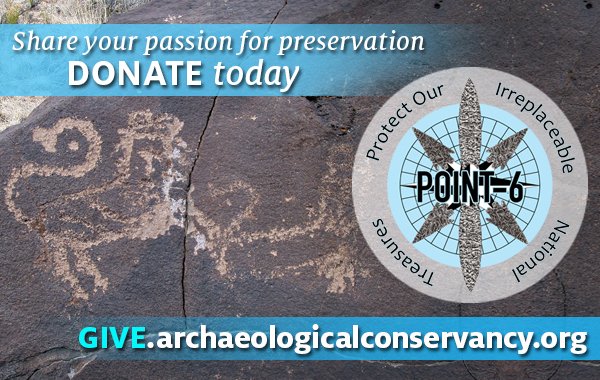 The POINT Program launched when The Archaeological Conservancy lost a significant site due to lack of immediate funds. The site was an extraordinary Hohokam village in Phoenix. The land was expensive, and we didn’t have the full amount in cash in our Preservation Fund. So we approached the landowner and explained our mission and the importance of protecting archaeological resources. Unfortunately, the landowner’s financial situation made this impossible. Although he recognized the cultural value of the property, he needed the money right away and sold to the first buyer with ready cash. Today, a warehouse stands on the site – the ancient village is lost forever. In response, we created an emergency fund for immediate cash purchases. This fund, the Protect Our Irreplaceable National Treasures Program, continues with POINT-6 today. The greatest obstacle to saving threatened archaeological sites is immediate funding, cash on hand to protect these sites. Driven by the need for emergency preservation funds, Leslie Masson & her husband Colin have pledged a $1 million dollar challenge grant to be matched dollar for dollar for phase 6 of the POINT program. We have raised $671,000 so far in gifts from foundations, corporations, and donors. In this new crowdfunding effort, we need to raise $29,000 to reach our next goal of $700,000 by June 2018. The funds will be used to quickly acquire highly endangered and significant archaeological sites around the nation. Every dollar you give to POINT-6 will be matched dollar for dollar, doubling your contribution to Protecting Our Irreplaceable National Treasures! The Conservancy has protected 134 highly threatened sites throughout the nation through previous phases of the POINT Program. To date, new POINT-6 funds have been used to protect three significant archaeological sites. The 135th site to be preserved with POINT funds is the Dein Ruin. This significant early twelfth-century archaeological site sits on a rocky terrace overlooking Aztec Ruins National Monument. Experts believe that Dein was part of an important ceremonial center in the larger Chaco Canyon system. Also included among these newly protected sites is the second parcel of Chickasawba Mounds, Arkansas, which was continuously occupied from the Late Archaic (ca. 3000 – 1500 B.C.) through the Proto-historic periods and was part of a chiefdom society. It is believed to have originally consisted of three mounds arranged around a plaza area. The Tinaja Pueblo, another POINT-6 acquisition, is a proto-Zuni site located near the foothills of the Zuni Mountains in the El Morro Valley, New Mexico. This 13th century masonry pueblo has more than 130 rooms and a large associated stone roomblock situated on a small mesa about thirty feet above the valley floor. These sites will be preserved in perpetuity for future generations of Americans. Today, superstores, fast food restaurants and parking lots take up an ever-increasing amount of our nation’s land and open space. Along with the natural resources that are consumed, such rapid, unchecked development also destroys our cultural resources. Once an archaeological site is leveled for development, that part of our national heritage is erased forever. Looters sell artifacts to unscrupulous collectors; vandals damage sites; and modern agricultural and industrial practices destroy sites forever. Now, more than ever, sites are in imminent danger of being destroyed or sold. This POINT-6 crowdfunding campaign makes cash immediately available to rescue sites that are in eminent danger from all of these pressures. Mark Michel, the Conservancy’s President, stated, “Having the ability to move quickly and to pay cash for a site greatly increases our chances of preventing its destruction.” Using crowdfunding allows us to reach outside of our regular contributors and involve more people in this great preservation project. All donations can be made at www.give.archaeologicalconservancy.org and will support protecting extraordinary sites across the country. With these funds, the Conservancy will ensure that endangered sites are preserved for posterity, saving phenomenal pieces of America’s history and prehistory.